We just returned from our first international trip with Chulengo. 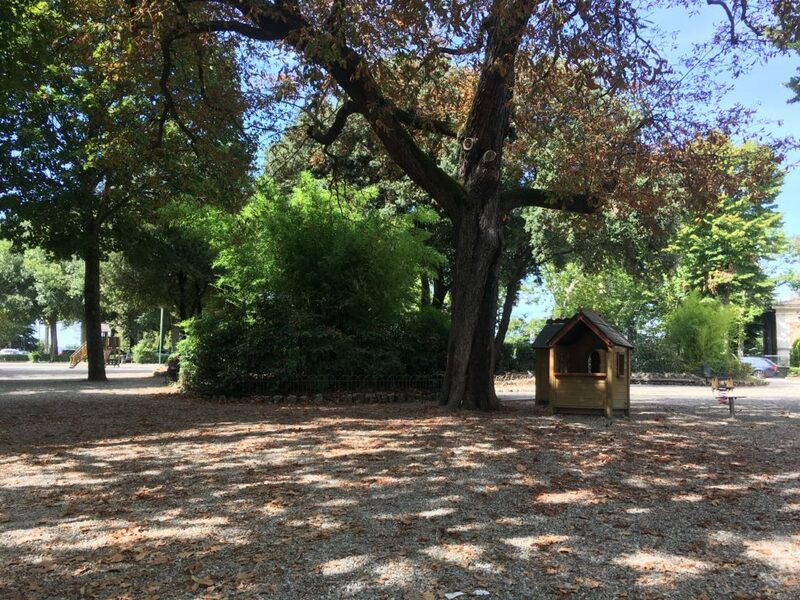 We explored Switzerland and Italy for two weeks. And we… SURVIVED! The flights were a bit challenging, with one being 10 hours and the other being 13 hours. But we made it. Traveling with a toddler was definitely exhausting and very challenging, but worth every second. 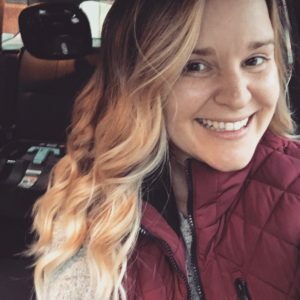 I did a lot of research before our trip, but I had a hard time finding details about traveling with a toddler. I was anxious about the details of our trip: where we would stay, what we would do, and where we would eat. 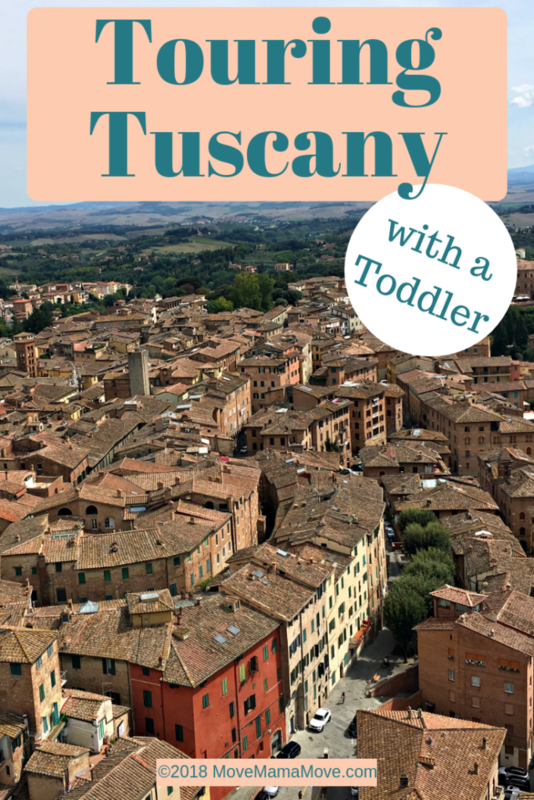 So, here I am in this post, to share with you the details of traveling to Tuscany with a little one. 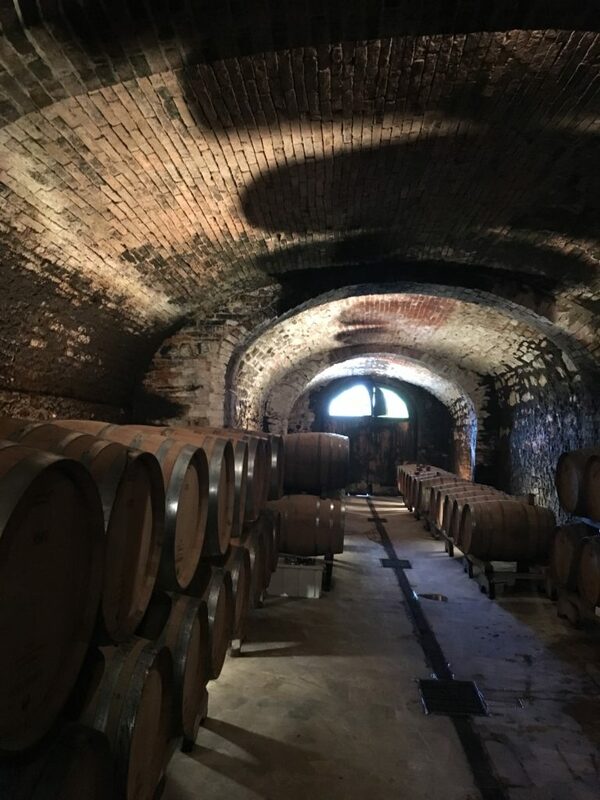 Tuscany is a region in central Italy that is rich with art and architecture from the Renaissance and is popular for its wine, olive oil, and breathtaking landscape. 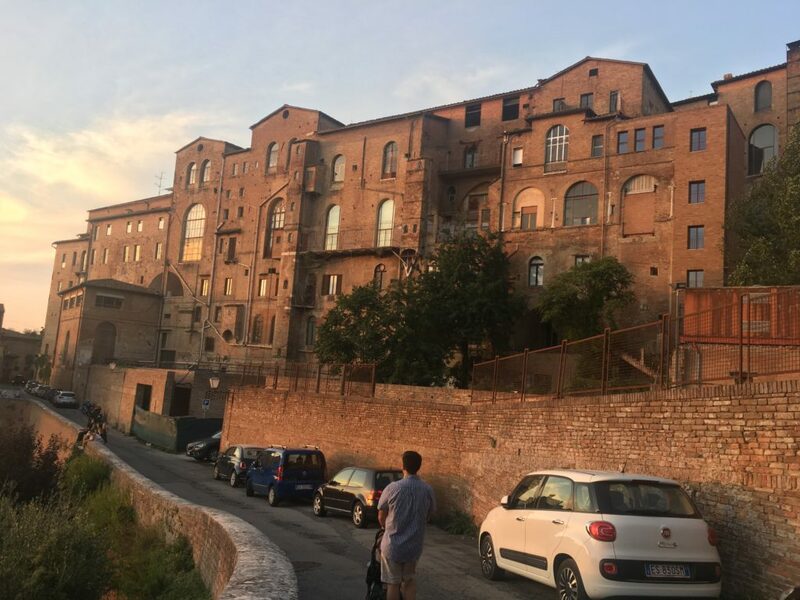 We stayed in Siena, Italy for five days and four nights. Siena is a small city in Tuscany about an hour and a half south of Florence. 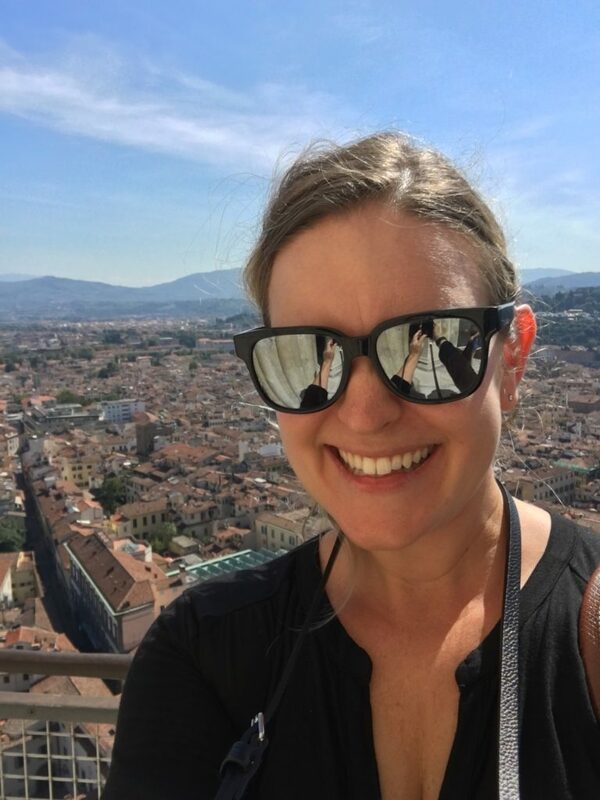 When we booked our trip with Audley Travel, we contacted them six weeks before we planned to be in Europe. Our agent said this was pretty short notice for any vacation, especially a trip to Florence during a popular time of the year. 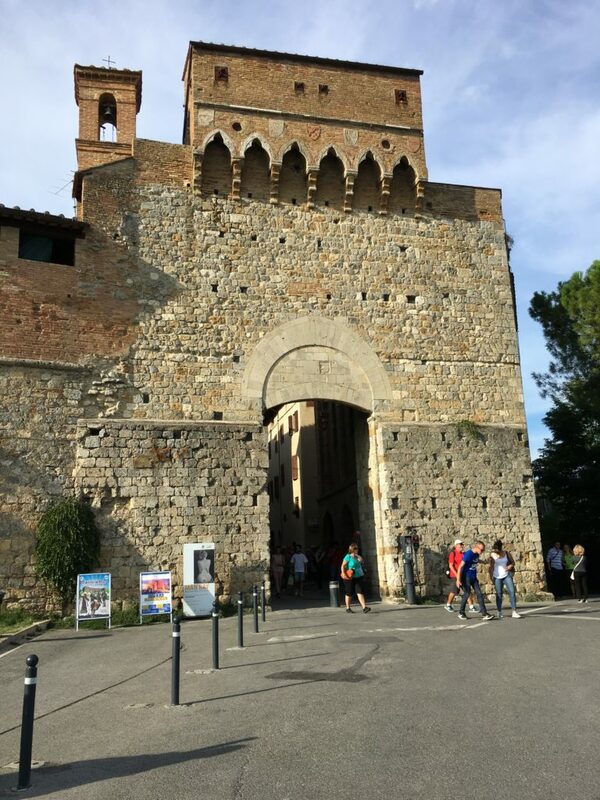 Most accommodations in Florence were full and our travel agent, Laura, recommended we stay in Siena instead. Honestly, I was bummed initially because I had heard so much about Florence from close friends and family and I had never heard of Siena. Well, I couldn’t be happier that we stayed in Siena. 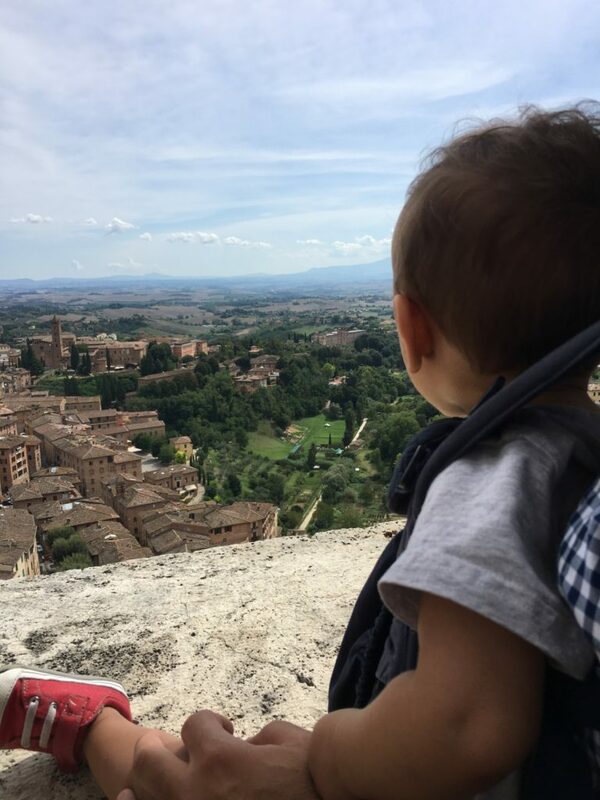 Holy cow, I think the Siena portion of our trip was the perfect vacation to take with a toddler. 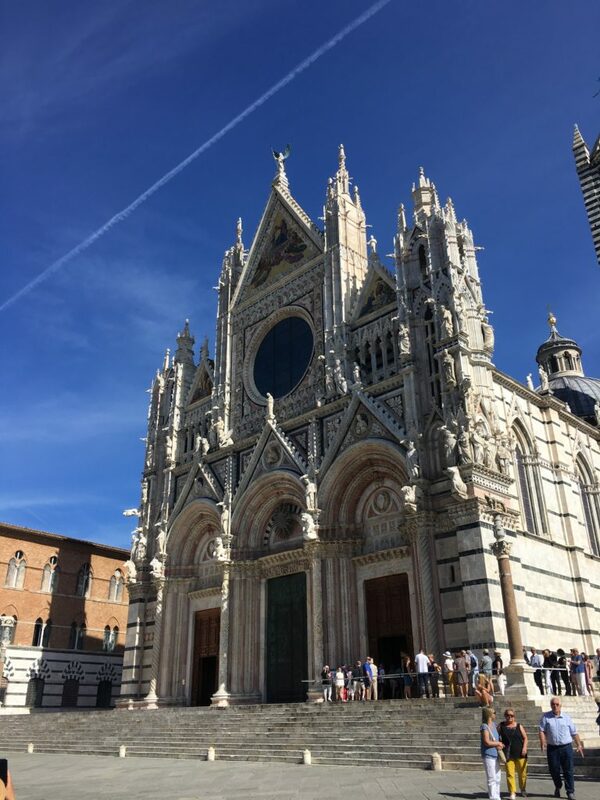 If you have kids, especially young kids, and you are looking for a place to travel in Europe, you MUST go to Siena, Italy. We stayed at Hotel Athena per the recommendation of our travel agent, Laura. The hotel was perfect for us for a number of reasons. One, it was just outside of the city walls but close enough that we could get almost everywhere in Siena by foot. 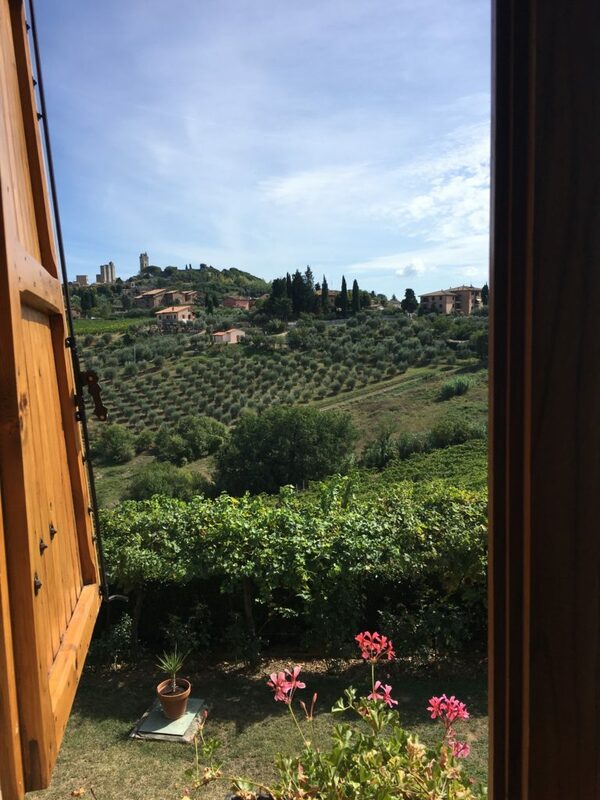 It was nice to be close to the action of the city but to also to experience the serenity of the Tuscan countryside by taking in the incredible scenic views from our hotel room. If we had a day excursion outside of Siena, we didn’t have to travel too far to get out of the city, which saved us time. 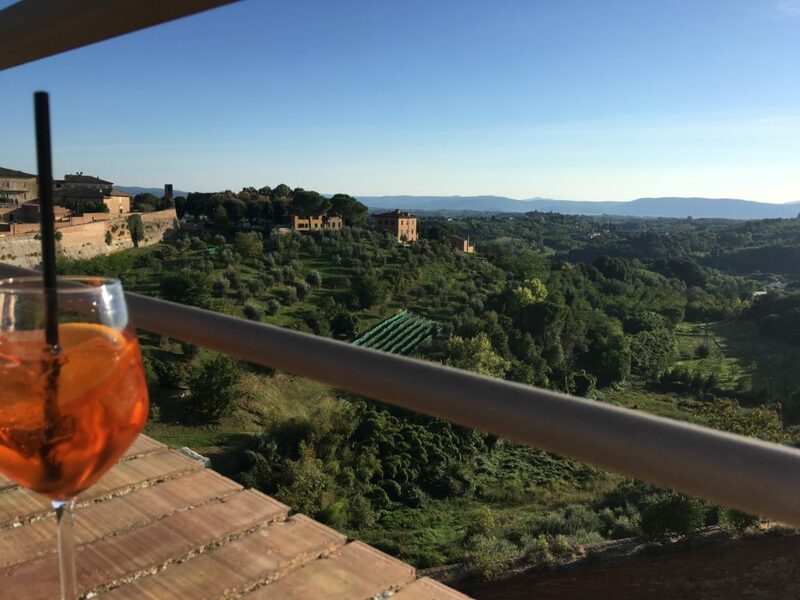 The second reason we loved Hotel Athena was that there were a bar and restaurant on the rooftop of the hotel which overlooked the rolling hills of Tuscany. We enjoyed a couple of cocktails on the rooftop while entertaining Chulengo and taking in the scenery. We opted not to have dinner on the rooftop. Chulengo was a little rambunctious on the evening we had available to eat dinner on the rooftop. We didn’t want to disturb other guests at the hotel with a wild toddler. Therefore, we opted for a couple of drinks before dinner time. The third reason Hotel Athena was perfect for us was that the staff were absolutely fantastic. Every time we arrived in the lobby, whether from a long day out or just coming down from our hotel room, we were greeted with sincere enthusiasm. 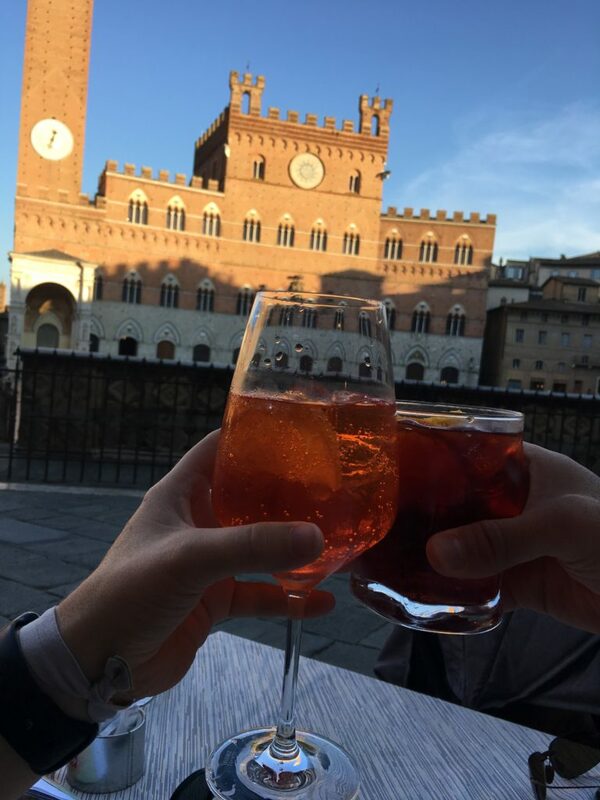 The staff gave us perfect recommendations for dining and activities during our free time in Siena. If there were any staff members, who were off-duty but in town, they remembered we were guests at the hotel and always said hello to us. The fourth reason Hotel Athena was so great was the breakfast included every single day of our stay. And when I say breakfast, I actually mean a glorious, delicious fantastic morning feast. All items were served fresh in a buffet style. 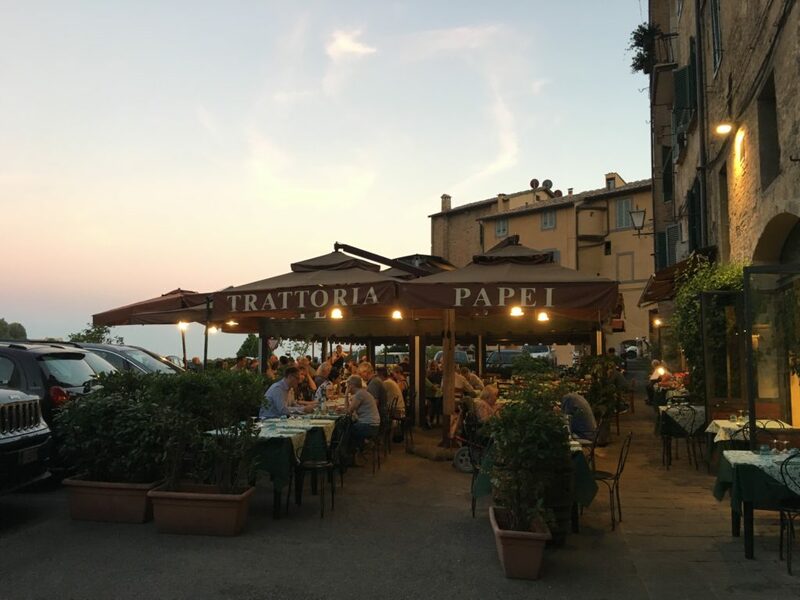 They served eggs, prosciutto bacon (which is the best thing ever), fresh fruit and vegetables, various cheeses and meats, cereal, oatmeal, and every type up of Italian pastry you could imagine. We loved the idea of having breakfast at our hotel so we could start the day off right. We could get up, get ready, grab breakfast in the dining room, head back to our room to gather essentials for our activities, and then head out for the day. 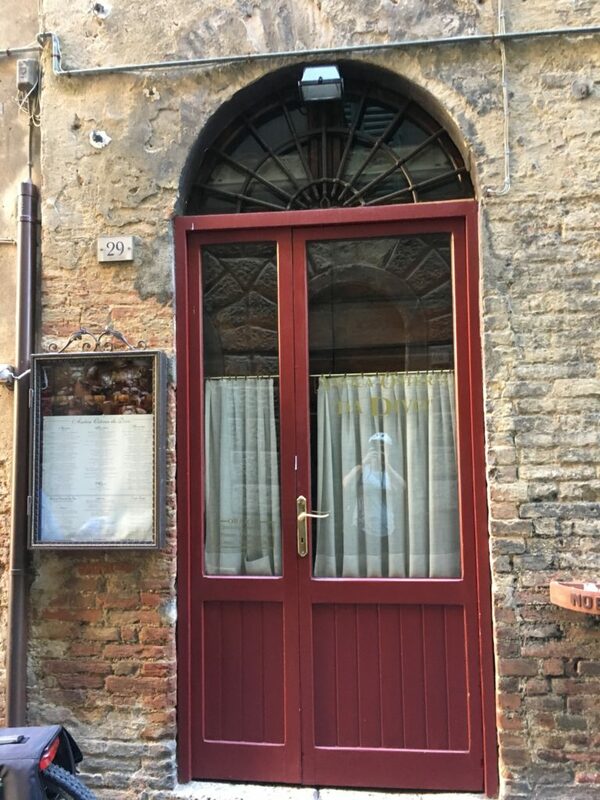 Hotel Athena was the perfect place for us to stay in Siena, but there are plenty of other options for accommodations. 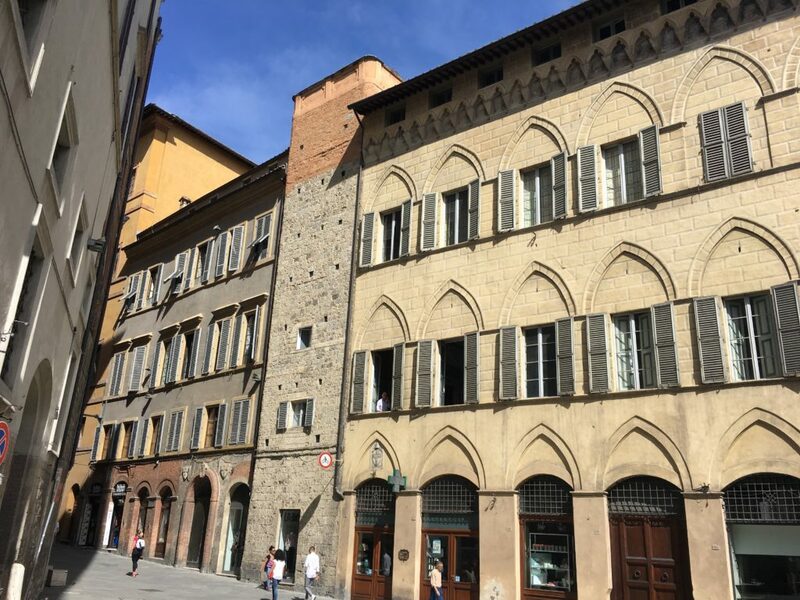 If you plan on visiting Siena, do your research to find what is best for you because there are a number of hotels, Bed & Breakfast Inns, and Airbnb options that can be an excellent match for your family. 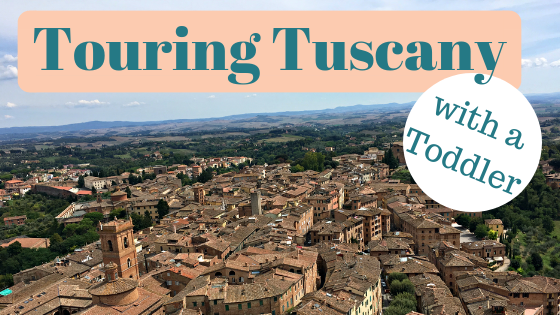 Okay, there is a ton of stuff to do in Siena and all of Tuscany. 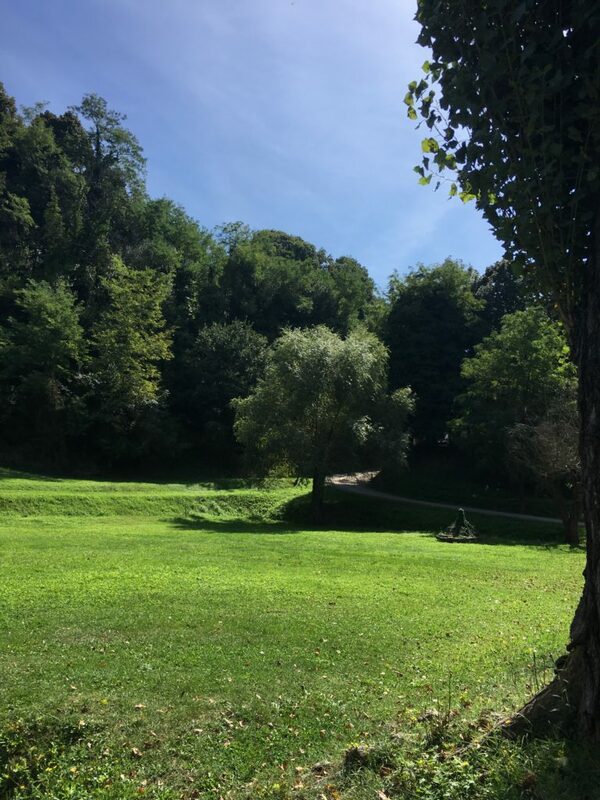 I will not even be able to scratch the surface with all the activities and excursions available, but I am going to try to give you a summary of activities we did with our toddler that we think others might be able also to enjoy. 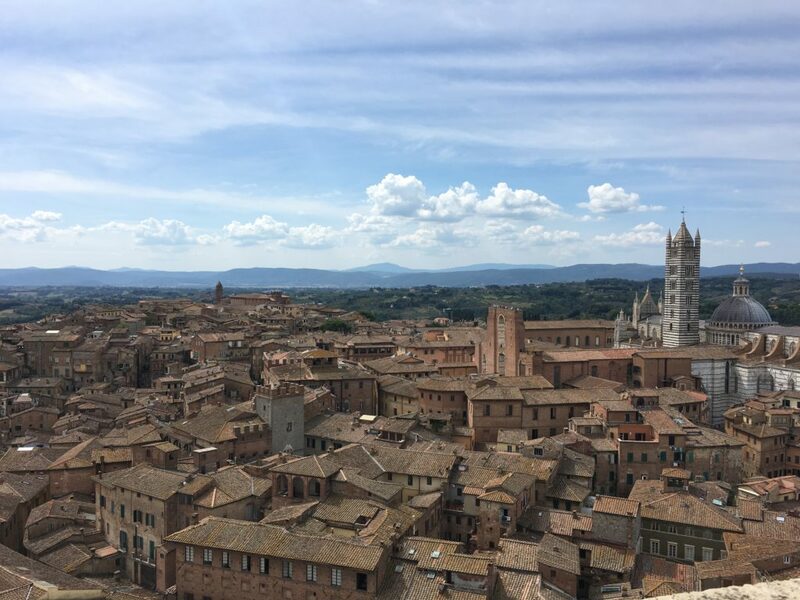 There are a couple of options to Tour Siena. You can complete a walking tour on your own, with a group, or with a private guide. 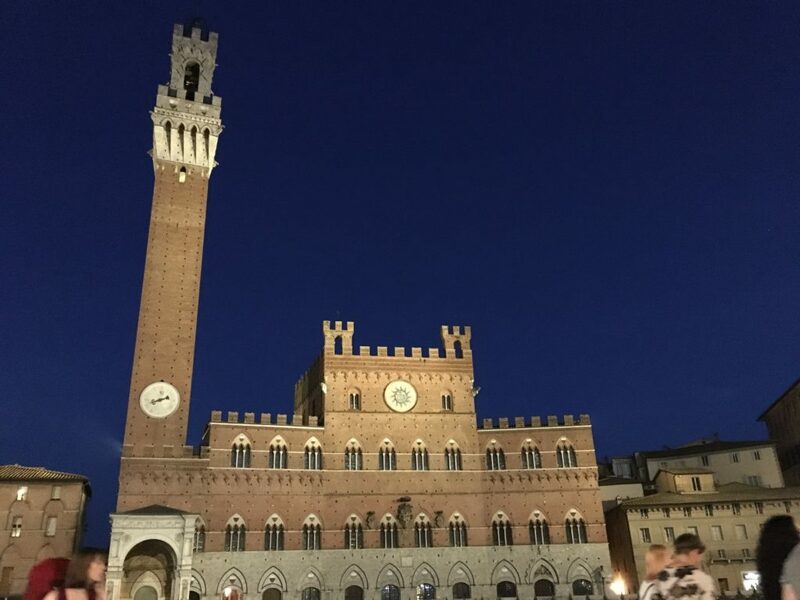 We spent the first evening in Siena walking around by ourselves, which we really enjoyed. Our hotel gave us a map of Siena, and we wandered around for hours. This was a great way for us to understand better the layout of the city and where our hotel was located about the city center. 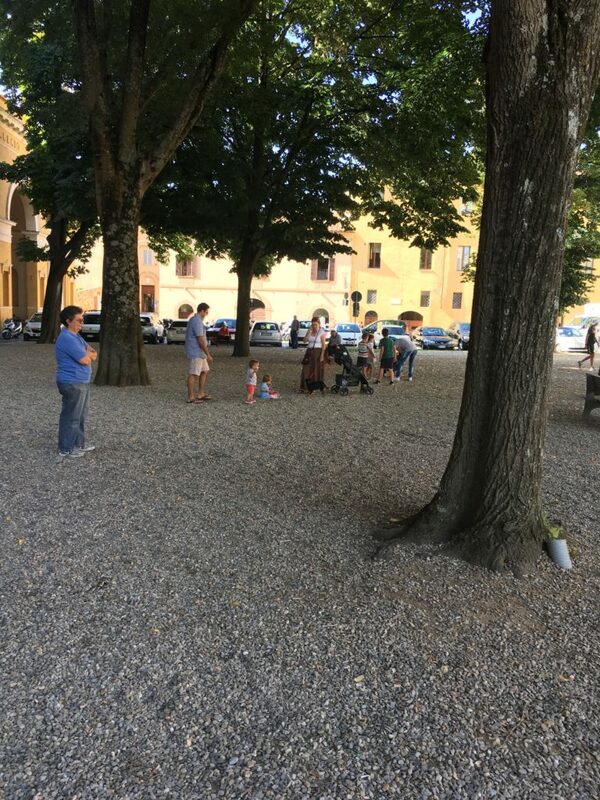 On our second day in Siena, Audley arranged a private guide to take us on a walking tour through Siena. After we had walked around on our own the evening before, I thought what could this guide possibly show us that we hadn’t already seen. Oh, boy was I wrong. Our guide, Sara, took us into all the nooks and crannies of the city. She explained the deep, rich history of Siena. She pointed out structures built as early as the 12th century. To stand next to a structure built over 800 years ago, that was not only still standing, but being used to house families, shops, or churches was incredible. Sara explained the Contrada system where Siena is divided up into 16 different Contradas, or neighborhoods. Each Contrada has distinct boundaries and is represented by a mascot. The communities are allies and rivals with each other and host regular gatherings and celebrations. I will go into more depth later about our experience with the Contradas. Having a private tour was ideal when traveling with Chulengo. We were able to make stops as needed to change a diaper or nurse Chulengo. We were able to move at our own pace without the worry of holding others up or getting behind. We could ask specific questions to our guide, tailoring the tour to our liking. We could alter the route of the tour if there were something we were more interested in seeing. Our tour was thorough and complete, yet flexible, which is exactly what we needed with Chulengo in tow. The tower between these two buildings was built in the 12th century. Woah! Ok, the concept of Contradas was something we found unique and enjoyable. 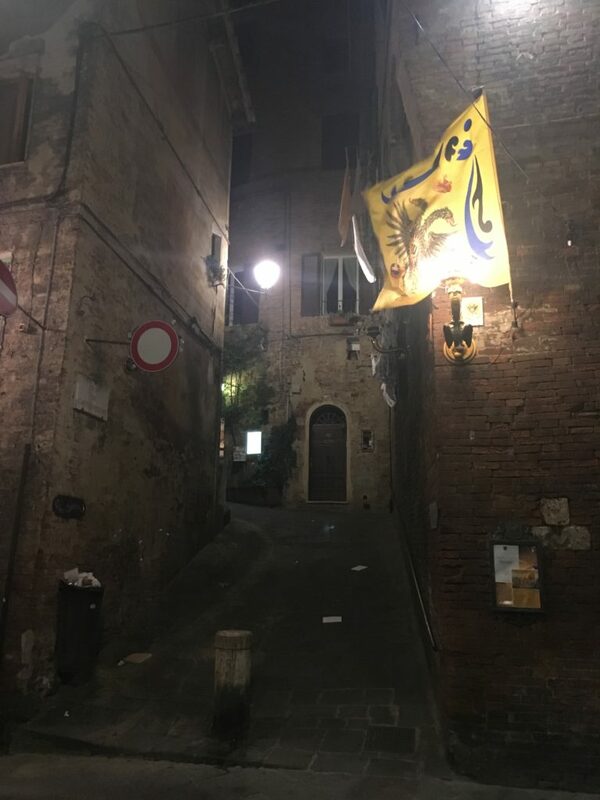 Each Contrada decorated the streets with their designated flag. One Contrada was near our hotel, so we walked through the neighborhood many times. Each time we passed this particular Contrada we were amazed. One time, there was a huge barbeque in their square. There were hundreds of people gathered, wearing a scarves matching the Contrada flag. Another time, we noticed someone run by us with a race bib on his shirt. He looked like a professional runner. My husband and I looked at each other like, did you just see that? Now, remember we were walking in the streets of Siena, which are barely wide enough to fit a car. And it was 10 p.m. — dark. All of the sudden another person ran by us. Within a couple of minutes, a dozen people had passed us with race bibs on. It turns out the Contradas had a race, and each runner was representing their Contrada. 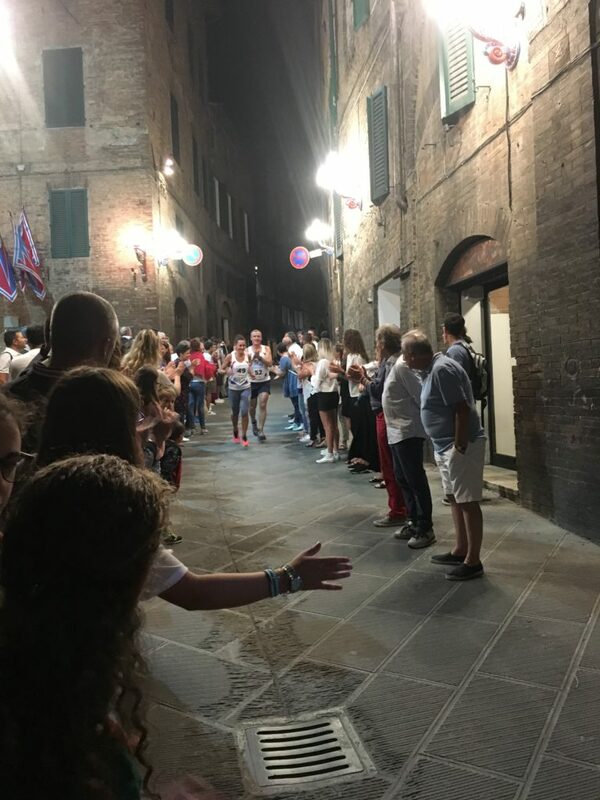 As we walked through Siena back to our hotel, past numerous and unique Contrada celebrations, we saw each Contrada cheering for the runners representing their neighborhood. Another time, there was a carnival-like celebration going on. One of the main attractions that caught our attention was a ramp, probably 6 feet high that zig-zagged back and forth. A young boy was standing on a block, holding a box at the top of the ramp, shaking it back and forth. We knew something was in the box because it made a lot of noise as he shook it rapidly. An older gentleman, standing next to the ramp, was speaking Italian over a microphone with extreme enthusiasm. We stopped and stared because we were intrigued. All of the sudden the man with the microphone points to Chulengo in the stroller while yelling into the microphone. A couple of little kids ran up to us with tickets in their hands. We purchased two tickets; one said giallo and the other said marrone. We were still confused but kept watching. 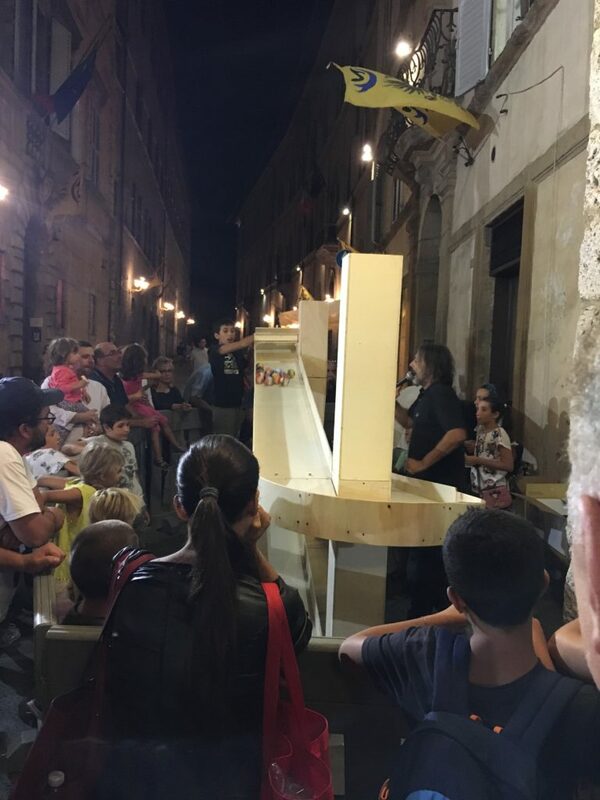 All of the sudden everyone started counting down in Italian, and the little boy released a small door at the front of the box he was holding. And a dozen colorful pool balls spilled out and down the ramp. We realized we were participating in a game to see if the colors on our tickets, giallo (yellow) and marrone (brown), would match the color of the first ball to cross the finish line at the end of the ramp. Thank goodness we lost. The winner of that round was given a giant Italian ham. Like, I am talking a 25-pound ham. If we had won, that would have never fit in our suitcase. Haha! We really took to the idea of the Contradas. The comradery and community we witnessed was something we have longed for in our current neighborhood. The celebrations among the neighborhoods were relaxed and family friendly with a focus on free play for the children. There were dozens of children joyfully running around, safely in their neighborhood. When we buy our first house in the (hopefully near) future, I hope that we can experience the same type of friendship and joy that the Contradas in Siena demonstrated. We rented electric bikes one day. The bike rental company dropped off two bikes to our hotel lobby and provided us with helmets, a baby seat on the back of one bike, and bike locks for each bike. 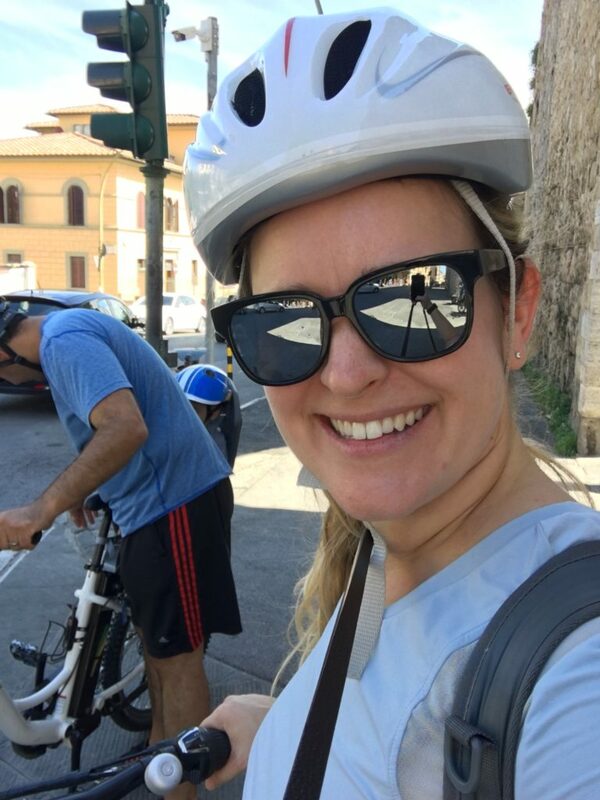 By riding the bikes, we were able to reach the far sides of Siena that were too far for us to walk. We stopped for a bit at a new playground to let Chulengo run around and play. 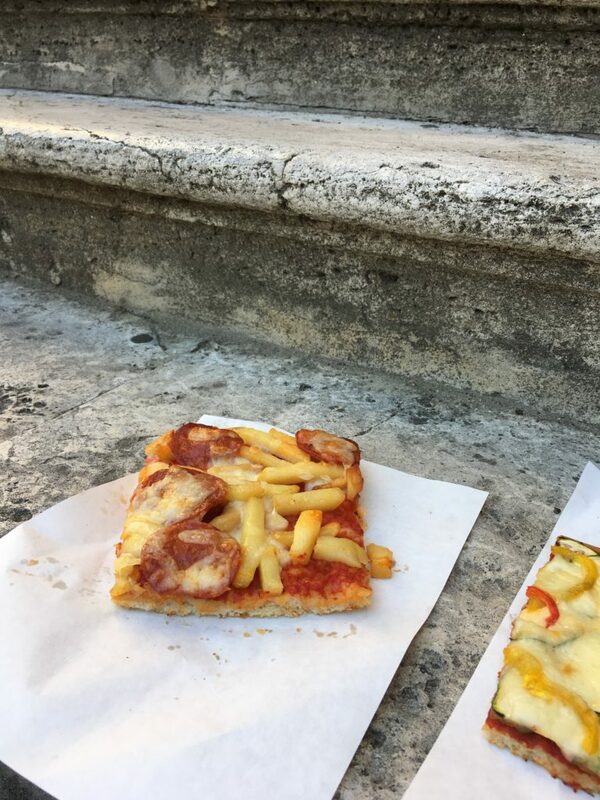 We ordered pizza from a small shop and ate it on the steps of an ancient building. We locked up our bikes and toured a Cathedral. We rode up and down the hills while Chulengo napped in the child seat. We could have signed up for a specific tour on the bikes, but we opted for rental only so we could see Siena at our own pace. 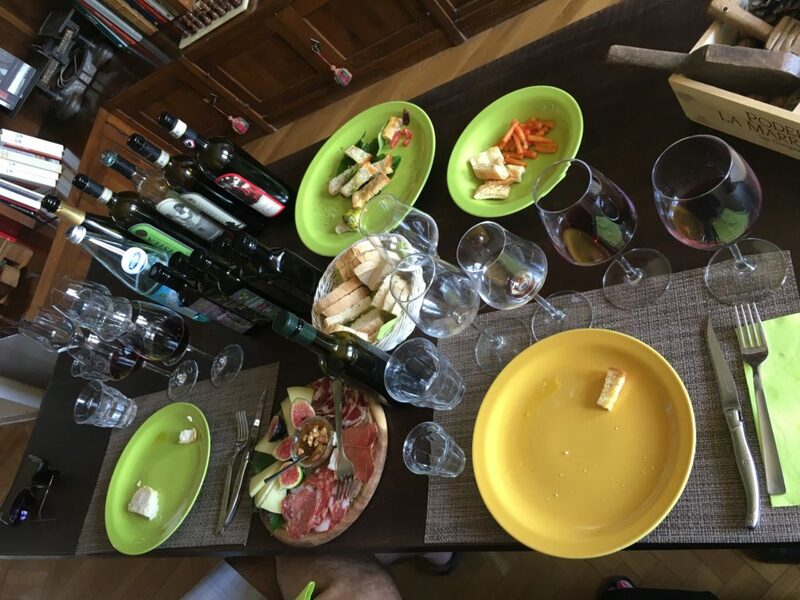 You cannot go to Tuscany and not participate in wine tasting. 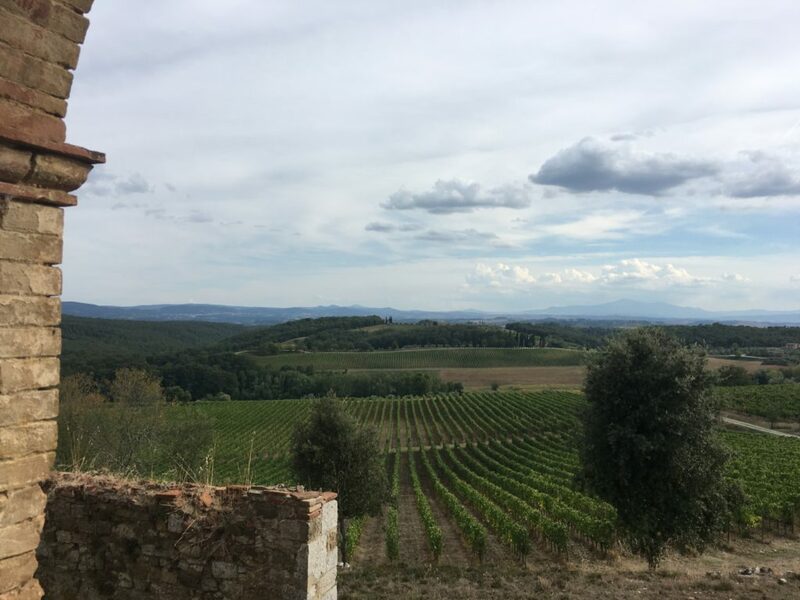 We spent two separate days touring the Tuscan wine country. One day we had lunch and wine pairings at a Farmhouse on a vineyard, and the other day we visited a vineyard with a guide and enjoyed a wine tasting afterward. Both excursions were special but very different from each other. 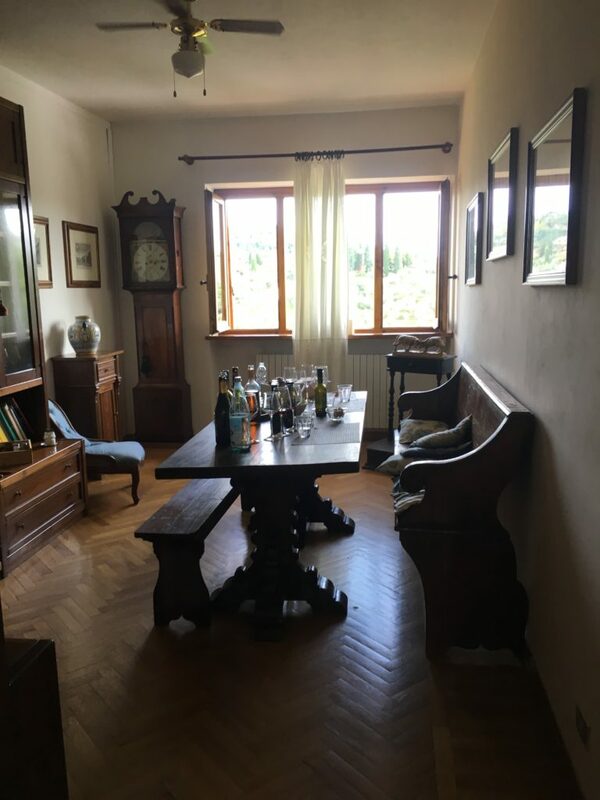 The first wine tasting excursion provided us with a private room in a farmhouse overlooking the vineyard, where we enjoyed a prepared lunch with wine pairings. Now, we really lucked out here. Chulengo fell asleep on the car ride over and slept through our entire lunch and tasting. Honestly, it was a miracle. My husband and I joked that if Chulengo had been awake, it would have been one of the most stressful lunches ever. We imagined ourselves having to rearrange the antique decor in our private room to keep all valuables out of Chulengo’s reach. But thankfully, Chulengo was exhausted from a busy morning and slept through a three-course-lunch, numerous olive oil tastings, and many wine pairings. My favorite part about this winery was that any wine or olive oil we ordered could be shipped to our home, back in the US, for free. That’s right, no charge! We are now anxiously awaiting our wine and olive oil arrival here at home. 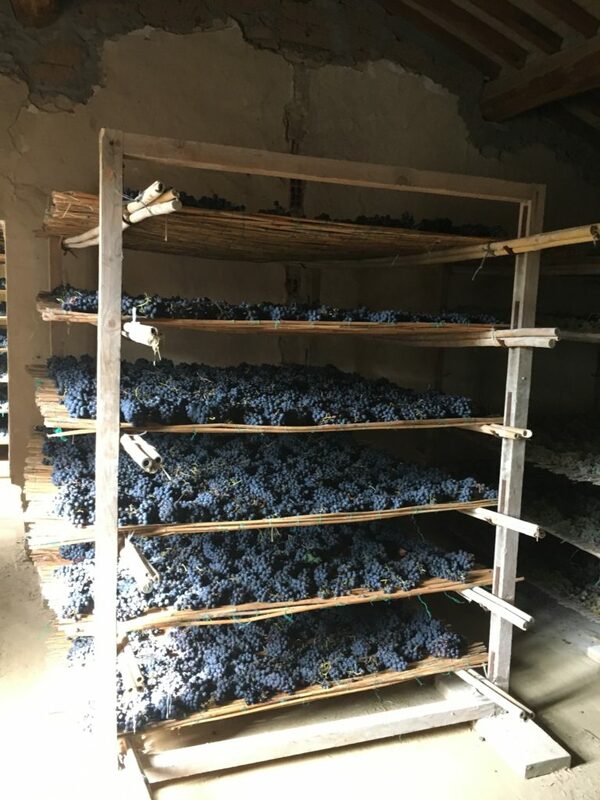 If you happen to be a guest in our house over the next couple of months, be prepared to enjoy some Italian wine with us. 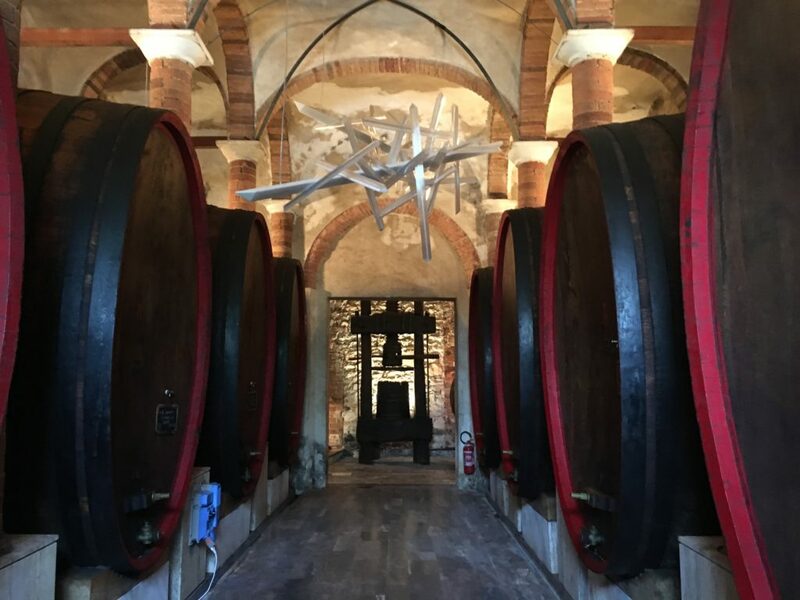 The second Tuscan wine tasting excursion we enjoyed involved an in-depth vineyard tour. This activity was a bit more kid-friendly compared to the previous wine tasting. When we arrived at the vineyard, we hopped in a truck and went for a ride with our host, Alice. 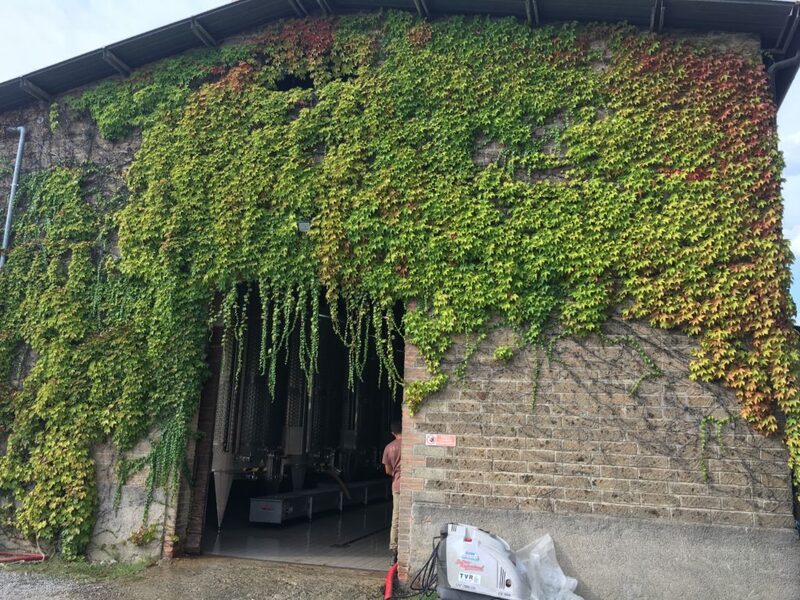 We drove past acres of vines and toured a tiny former church that was turned into a place to dry grapes. 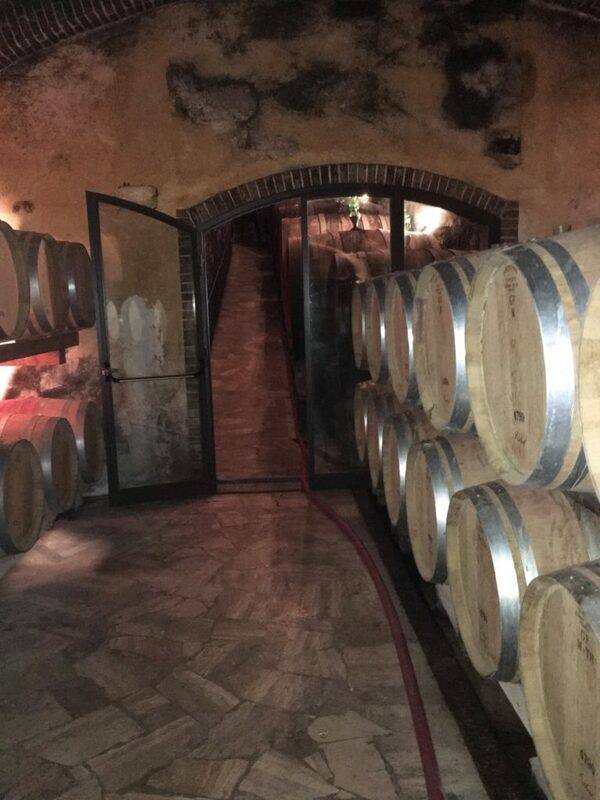 Alice then took us to the barn and cavern where the wine barrels were stored underground. It was very different compared to the barrel storage I have seen in Northern California. After our vineyard tour, we sat and went through a traditional tasting. Chulengo had many snacks and lots of stickers to get through this portion of our day. There was a grassy area for him to run around, which took the pressure off of us to entertain him in the tasting booth. We again, ordered more wine to be sent home, as we found a couple of bottles tasted delicious. Torre del Mangia is a tower at Piazza del Campo. 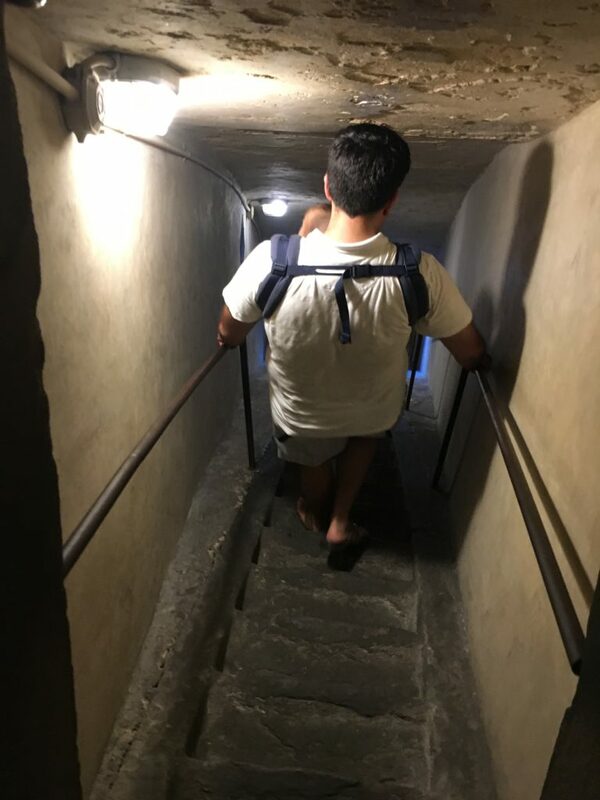 For $10 per person, we climbed up hundreds of steps to the top of the tower that overlooks Siena. While this was challenging, with Chulengo strapped in a baby carrier, the views were fascinating. I am a wee bit claustrophobic, so the hike up the stairs was a little nervewracking, but worth it. We were only allowed to spend 15 minutes at the top, but I wish we could have spent all day. 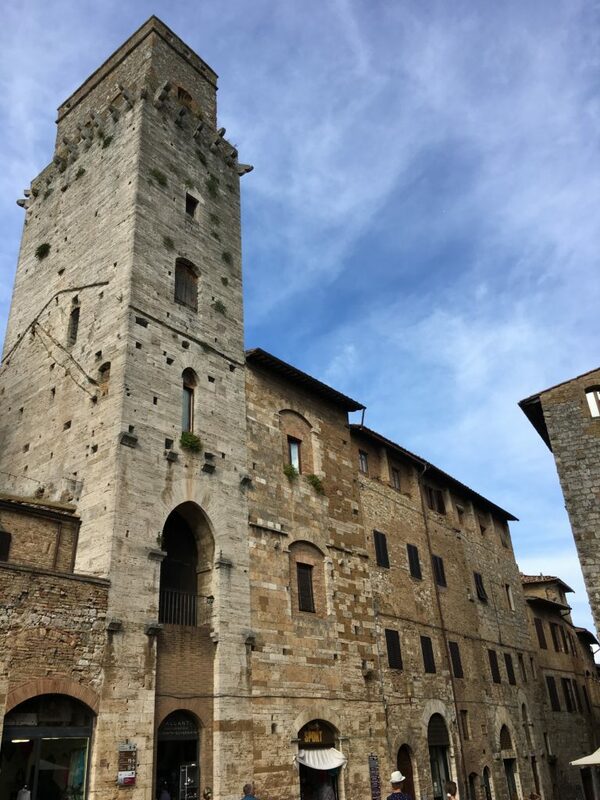 San Gimignano is a small medieval town upon a hill in Tuscany, enclosed by walls built in the 13th century. We spent a couple of hours touring the small city on our own. We found a piazza for Chulengo to run around and enjoyed some gelato as we walked. The town was historic and walkable. There were shops to find local Italian products and churches to tour. Two to three hours was really all that was needed to see the town. The concept of a piazza was new to me upon arriving in Italy. If you have never heard of a Piazza, it is like a town square that serves as a major gathering area for the community. Often, you will find a church, restaurants, and local entertainment in the piazza. Our last day in Tuscany, we spent the morning touring Florence. Our private guide from Siena, Sara, also guided us around Florence. We were able to push Chulengo in the stroller during our tour. We saw the Statue of David and climbed to the top of the Duomo which overlooked all of Florence. 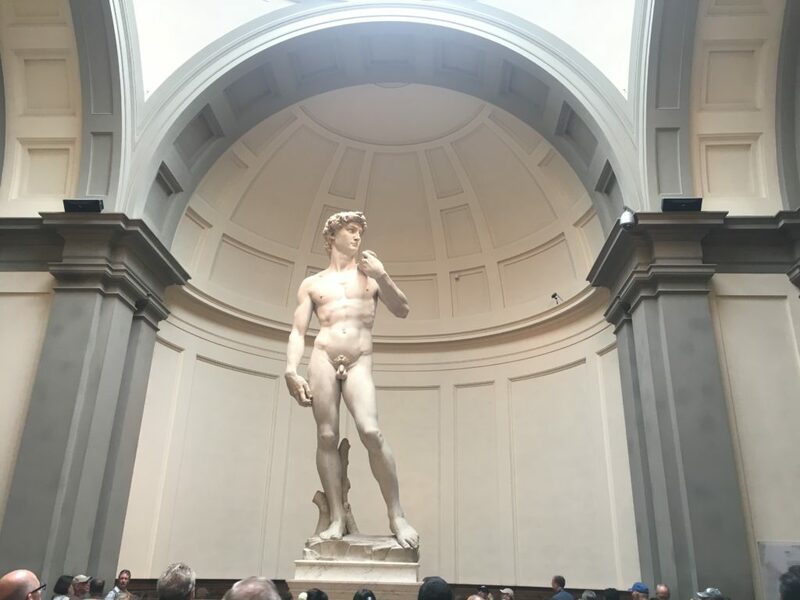 Because we didn’t have much time in Florence, there was a lot we did not get to see. 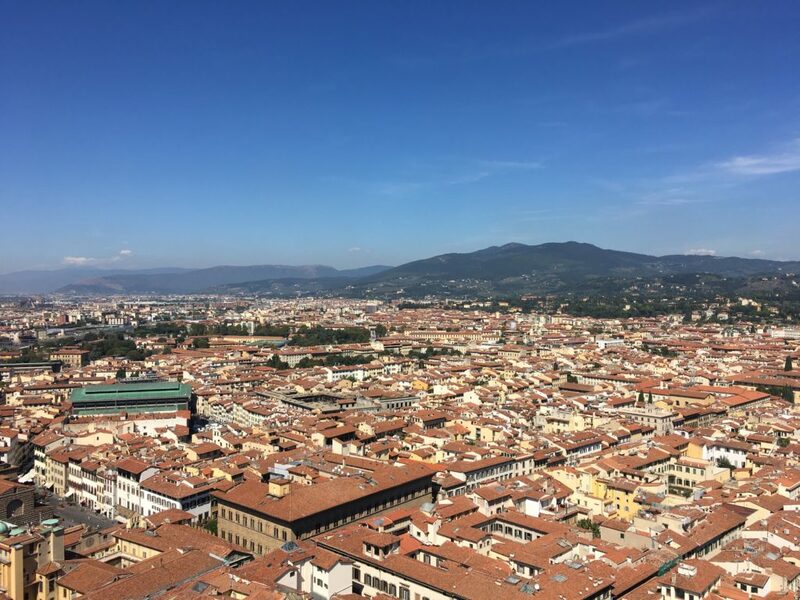 But, we have put Florence on our list of places to go back and visit someday in the future. 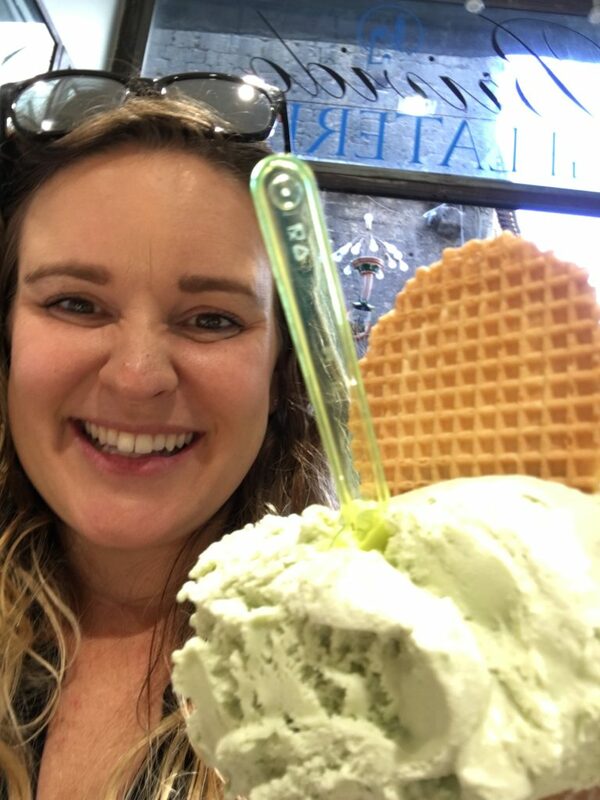 There are so many options for food in Siena, but I am going to share with you our favorite places that were kid-friendly. This is a fancy place, and you must make a reservation. This was a fantastic dinner, but not as kid-friendly as we would have liked. Tables were closer together, the dining room was dark, and the ambiance was pretty quiet. Each course also took a while to come out. I think it took us about 2 hours to finish a 3-course meal. The servers would entertain Chulengo each time they passed by the table. Our appetizer came out 45 minutes after sitting down at our table, and Chulengo started to grow restless. My husband and I had to take turns taking Chulengo outside while the other one ate dinner. The food was absolutely fantastic, some of the best I have ever had. We ordered the risotto served from a pecorino cheese wheel and a lobster pasta that we had to shell at the table. The kitchen, which has a door that opens to the street, was regularly entertaining Chulengo while we each walked around outside to keep him calm. One chef, in particular, would pass food to Chulengo as we walked past the kitchen door. Two words: Florentine steak. I am drooling right now as I type this, just thinking about the steak we had. It was the most fantastic steak we have ever tasted, and it was reasonably priced. You chose the size of steak desired, with a minimum of 1 kilogram. Even if you order just the minimum, you will receive a huge steak you can share among a family. This trattoria was very kid-friendly. The staff entertained Nima to help keep him happy. Their outdoor seating is always a perk when eating with a messy toddler. We requested a half bottle of wine. The server brought a full bottle to the table and only charged us for the amount we consumed by the end of dinner. If we just had half the bottle, they charged us for half. If we had a quarter of the bottle, they charged us for a quarter of a bottle. Probably one of the most kid-friendly restaurants we’ve ever been. The servers would regularly entertain Chulengo with toys and conversation. Small, half bottles of wine were available to order. The server poured the wine into a decanter and let Chulengo smell it, which he found very entertaining. Reservations were not required, and there were quite a few tables available at 7:30 pm when we arrived. I had a truffle pasta which was so delicious I wanted to take a bath in the pasta. 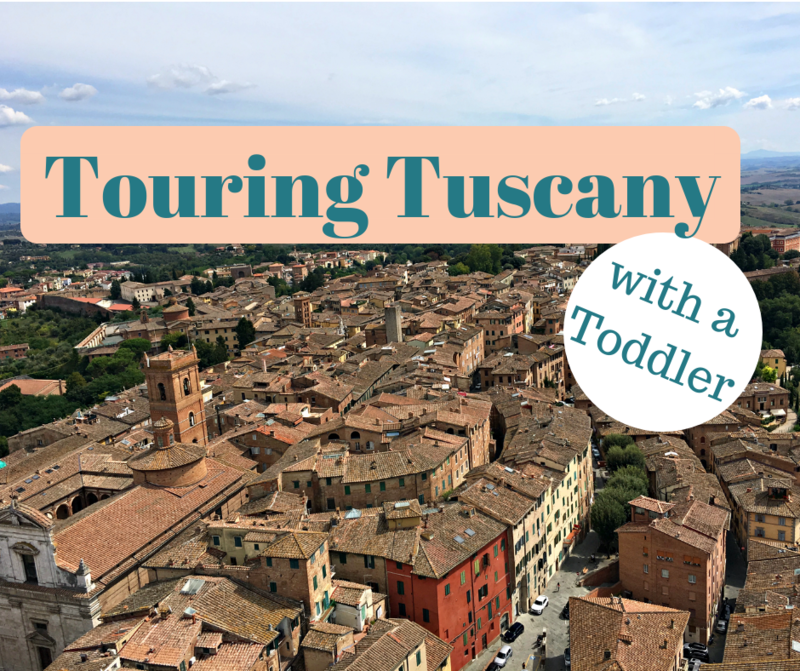 Located right on Piazza del Campo which makes for great scenery and people watching. We chose this restaurant in the late afternoon because Chulengo was napping in his stroller and we thought it would be nice to sit and have a few drinks. The drinks were delicious, and small snacks were served complimentary with the drinks. We decided to stay for dinner, and the food was okay. I had spaghetti with bolognese sauce which tasted pretty typical. My husband had a different dish that was delicious. The ambiance made up for the average food. La Trofa – we ordered a couple of slices to go and ate it while sitting at Piazza del Campo. So delicious. Caro Amico – a little pizza parlor on the corner of a street. We ordered four pieces of pizza and spent less than $5. The pizza was fantastic, and we sat on the steps of a nearby church and loved every bite. My one piece of advice is to find a place that has a line and enjoy your gelato. 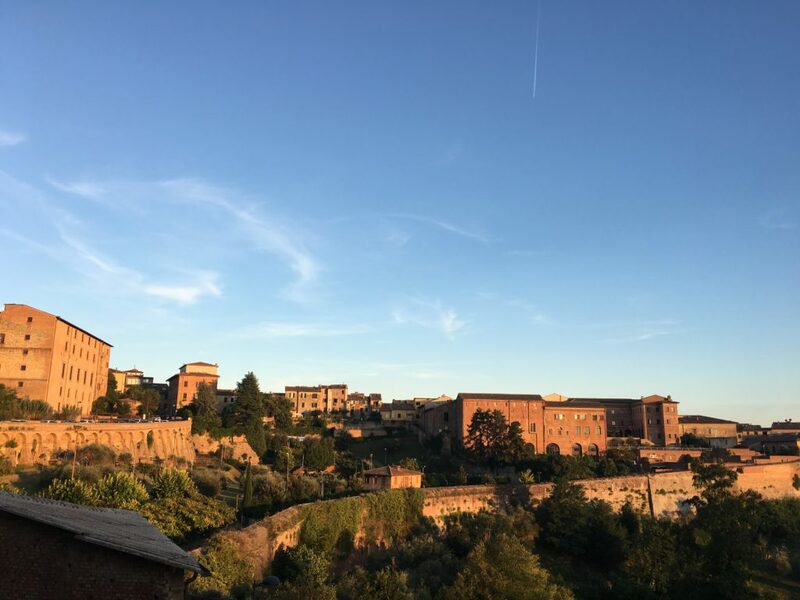 There are a ton of options in Siena. I felt like there was a gelato shop every few dozen meters and each one we went to was delicious. The first of many gelato treats! Take a travel stroller with you. It is easy to transport on a plane, through the airport, in a car, and at restaurants. Ask the locals for recommendations. One local said, if the restaurant is busy at 5 pm, beware because locals don’t eat dinner until 8 pm or later. Plan your excursions around nap time; you may enjoy activities more. Hire a driver to get you from place to place. We even requested a car seat, which made trips easier because we weren’t required to lug our car seat around on excursions. If you want wine at dinner and can’t share an entire bottle, order the half bottles. Just as yummy, cheaper, and you don’t feel like you are drinking wine just to finish the bottle. 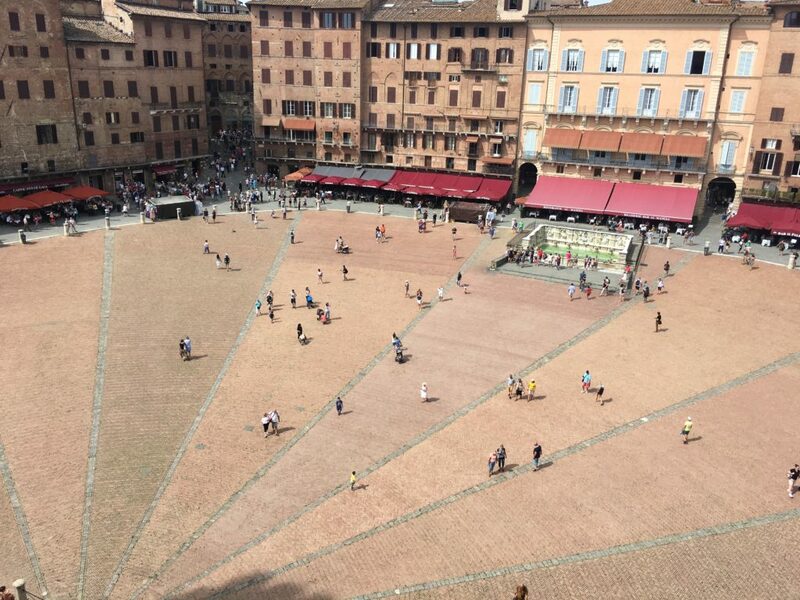 Get a map of Siena and just start walking and exploring. You will be amazed at the breathtaking history, scenery, and architecture you will find. If you ever head to Siena, let me know! I would love to hear all about your trip.